I strongly oppose Chairman Ajit Pai’s plans to gut the FCC’s longstanding media-ownership rules. Runaway media consolidation has been a disaster for local communities, and Pai’s order would make things much, much worse. Our communities need diverse viewpoints and strong newsrooms. But these changes would give a few giant companies far too much power over the public airwaves. I’m appalled that the FCC would try to push these dramatic and dangerous measures with no public input. So here’s mine: Don’t do it. FCC Chairman Ajit Pai is proposing to slash some of the last remaining protections we have against massive media consolidation. The FCC must stop this full-scale assault on local media. Pai’s despicable proposal is nothing but a corporate giveaway to big broadcasters like Sinclair. Loosening the local television-ownership rule would make it easier for big broadcasters to gobble up two, three, four or more stations in a single market, which would result in the exact same newscasts on every channel. It gets worse: Eliminating the newspaper/broadcast and radio/broadcast cross-ownership rules would allow one company to own the major newspaper, TV outlets and radio stations in a single market — which would leave communities like yours without diverse viewpoints or local reporters competing for scoops. Rampant consolidation would disproportionately harm people of color, low-income communities and rural residents because they tend to rely the most on broadcast outlets for news and information. Instead of listening to the people, Pai wants to shove these changes through in less than three weeks without any public comment. But we won’t be silenced. 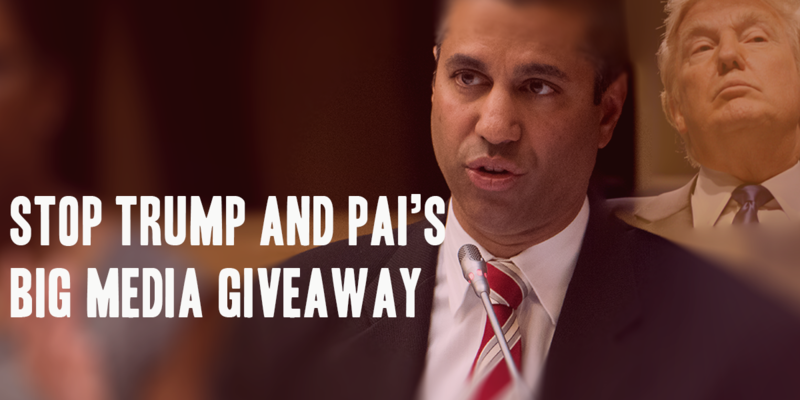 Urge the FCC to protect diverse local voices and block Pai’s dangerous proposal.